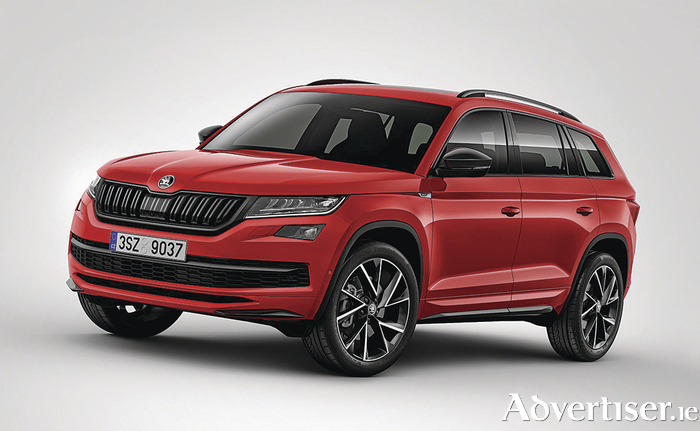 Czech car manufacturer Skoda will present a more elegant, dynamic variant of its new large SUV with the new Kodiaq Sportline. The Skoda Kodiaq Sportline makes its world premiere at the Geneva International Motor Show on March 7, and comes with a choice of two petrol and two diesel engines ranging from 150PS to 190PS. Design features specifically developed for the sporty model variant shape the exterior and interior. Its exterior length of 4.70 metres offers up to seven seats, as well as the largest amount of interior space and largest boot capacity within its segment. The design of this new all-rounder mirrors the brand’s design identity, and blends emotion and rationality in one package. Furthermore, Skoda says it comes with features designed to provide pure driving pleasure. The bodywork elements and special features finished in black underline the Kodiaq Sportline’s dynamic focus. Skoda says the radiator grille, roof rails, wing mirror housings and side window trims all come in black while the rear window and rear side windows are tinted. The rear is enhanced by a narrow, silver-coloured trim below the bumper. The side view of each of the Skoda Kodiaq models is characterised by short overhangs, their sloping roofline that is visually extended by a line in the D-pillar, and the tapered rear. The protective side trims of the Skoda Kodiaq Sportline are body-coloured. It comes with 19-inch alloy wheels in a special new design as standard. As an option, 20-inch wheels are also available. It also bears a small badge with the model designation on the front wing. Meanwhile, Skoda has a second hand as it continues its campaign in the SUV segment. With the Skoda Kodiaq Scout, it will also present a model variant at the Geneva Show that exerts its off-road capabilities both visually and in terms of technology. Skoda says the rugged and robust appearance is accentuated by silver-coloured design details including distinctive underbody protection at the front and rear. The 19-inch alloy wheels specially created for the Kodiaq Scout also contribute to its powerful appearance. A s with the Sportline version, a choice of two petrol and two diesel engines is available for the new model variant, which comes with all-wheel drive in all versions. With a length of 4.70m, up to seven seats as well as the largest interior and boot within its class, the Skoda Kodiaq has attracted a lot of attention. Skoda says the design reflects the brand’s design identity and represents a good combination of emotiveness and rationality. The new Kodiaq Scout model variant clearly underlines robustness and strength with its distinct design features. More on both the Kodiaq Sportline and Scout models in the weeks ahead.